Here at Wm. Prager Ltd., we’re proud of all our projects. The latest installation for Trade Secrets was a great one. 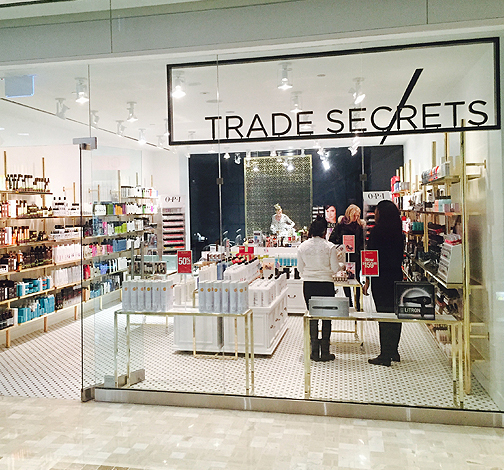 Located in the Toronto Exchange Tower, Trade Secrets opened it’s first glorious test store! The wall system and fixtures are beautifully appointed in bright brass finish. Randy Jemmet, our corporate sales manager, worked hard on completing this project by using unique designs for two small and large custom tables and a nail bar!! The wall system features upright slotted standards with rear slotting. Attention to detail was characterized by a magnificent 5′x7′ high laser cut panel suspended from the ceiling to divide the retail store section of the spa and hair styling. This installation looks bright, and is consistent and simple in its elegant design elements – so worth a visit! !